Posted August 26, 2010 under Ask the Mediatrician. Q: My teenage sons love watching Family Guy, but I am not sure they understand the sarcasm? Are preschoolers affected by watching professional wrestling? Posted August 23, 2010 under Ask the Mediatrician. Q: I am a Pre-K Special Educator and some of the boys have hit, kicked, scratched, punched, and head-butted me and their classmates. I know their parents watch professional wrestling with them. Do you know of any research connecting this behavior with what they are watching? Posted August 13, 2010 under Ask the Mediatrician. Q: What are your thoughts on animal programs that show graphic killing that is in the wild, like “Big Cat Diaries”? I’m not sure if they are appropriate for my 4-year-old. My kids are asking for toy weapons; what should I do? 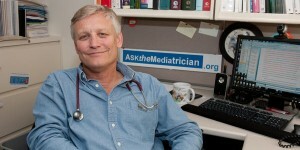 Posted August 10, 2010 under Ask the Mediatrician.